When itcomes to beverages, particularly fizzy drinks such as beer and carbonates, the glass bottle is generally perceived as delivering a high-quality consumer experience. In 2013, it seems metal packaging manufacturers took this as their main challenge, coming up with various innovations which aim to not only enhance the experience of drinking from a metal beverage can but also generally improve the perception of this packaging format. Euromonitor International’s latest beverage packaging research, which has just been published, reveals how this has paid off, with retail volumes of beverage cans predicted to have grown 1.9% over 2013. Glass bottles continue to hold the first place in global retail sales of alcoholic drinks packaging with a volume of 201.7 billion units. The pack type is able to meet the quality expectations and tradition which are highly sought after in beer, wine and also in spirits. Ceramic bottles (included within 'other packaging' in the chart avove: Top five pack types in global alcoholic drinks in 2013 and forecast growth), another pack solution conveying quality, hold a very minor share in comparison as a traditional choice for some of Asia’s local spirits like baijiu in China. Folding carton’s presence is also very much confined to its role as gift packaging in spirits and are mainly benefiting from the dynamic rise in demand for whiskies occurring in India. Outside of the remits of quality positioning, the PET bottle is very much limited to economy beer in Eastern Europe. 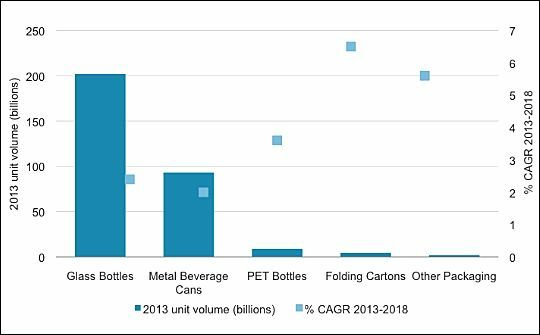 The only major competitor to glass in the alcoholic drinks industry is therefore the metal beverage can, which represents a significant 93.2 billion unit volume in 2013. The beverage can is also anticipated to grow at a very similar pace to glass over 2013-2018, at a CAGR of 2%. Although the beverage can has been mainly convincing in terms of its convenience on-the-go, its manufacturers are putting efforts into demonstrating that innovation can enable the can to deliver a higher quality of experience and thereby raise the pack’s profile in consumers’ minds. Innovation in metal beverage cans in alcoholic drinks is perhaps nowhere more relevant than in beer. In Brazil, for instance, where there has been an increase in demand for more premium beer, A-B InBev chose in 2012 to trial the use of thermochromic ink on its Antarctica Sub-Zero brand. Developed by leading metal can manufacturer Rexam, the 350ml can changes colour to inform its user that its contents are cold enough to be consumed. In the Netherlands, major domestic lager brand Grolsch, known for its glass bottle with a traditional swingtop closure, also differentiated its 330ml cans in 2013 by fitting them with a foil-based “quality liner” inside. The extra layer aims to preserve the taste of the beer by eliminating direct contact with the can so as to better compete with the glass bottle. Other brewers decided to reassure consumers about hygiene standards when drinking from a can. By adding a plastic closure to the container, brands are not just conveying the message that the product is well protected from any contamination when sold to the end consumer, they can also offer some level of reclosability, once again so as to better compete with bottles. Beer brand Colonia is an example in Brazil. In carbonated water in Spain, using a plastic closure was perhaps even more key for brand Vichy Catalán when releasing the only metal beverage can available in this category. The impact of such innovations on metal beverage can volume growth is perhaps small. However, beyond the added value being offered to consumers, these developments enable brands to be seen as more modern and appealing. Crown’s new laser-etched tabs technology provides beverage brands a new way to engage consumers and build brand loyalty. It is now being offered to customers in the US and Canada for the first time. They are compatible with all can sizes and types of beverage ends. A new two-stage printing process developed by Ball Packaging Europe enables the production of up to 36 individually designed cans in one production run. 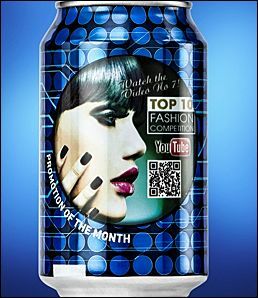 ‘Digital window printing’ helps to create and execute unique promotions by combining standard with digital printing. The new two-stage process allows beverage producers to present their cans with a range of up to 36 different designs at the point of sale. 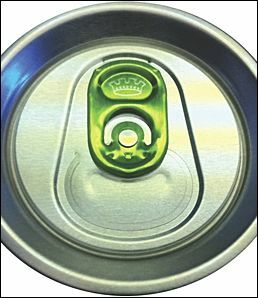 In the first step, standard 33cl or 50cl aluminium cans are produced the usual way, just leaving a ‘window’ unprinted. In the second step, the cans are passed through the digital printing line where customized designs are added to the can, exactly fitting the window that was previously left clean.